How cute are penguins? They are super cute!!! That’s why this t-shirt is going to blow your socks off. If riding the rides in the mall by inserting a coin and it taking you away puts a smile on your face, then you will want this t-shirt. 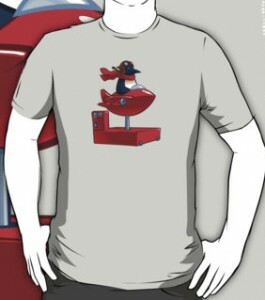 It features a bright red spaceship ride with an adorable penguin ready to take flight. He has his googles and scarf on, but wait! He needs $2 first. Help him out. This t-shirt comes in a number of colorful choices like orange, purple and green. It comes in a full size run ranging from a Small to 3XL. All the ladies and men can enjoy this t-shirt due to it’s unisex fit. Pop in a quarter and get the ride started with the Insert A Coin For A Ride T-Shirt.